Learning a musical instrument has to be one of the most rewarding pursuits in life. Not only that – recent medical studies show superior brain development and emotional enrichment simply from learning an instrument. 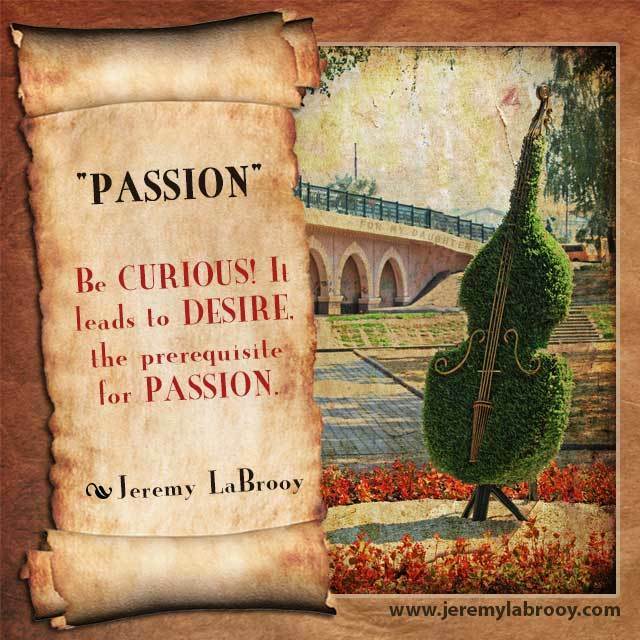 And I, Jeremy LaBrooy bass teacher in Melbourne, will tell you there’s no better instrument to play than the bass. None, I say! Am I biased? You bet! I love the bass! Passion is always at the heart of any serious performer and a passion is always derived out of a strong desire to achieve or do something. But how do you develop a desire for something? First of all, you must have an experience… see something, hear something, touch something, feel something, maybe even taste something. But that’s not enough. All people see, touch, hear taste & feel things every day. Experiences that have a profound effect on us are usually experiences that move us. Not only just emotionally or spiritually, but possibly more importantly, move us to taking further action. To know more, to see more and hear more. You should train your mind to be inquisitive – to be curious. Asking more questions and delving into a learning process creates thinking patterns that promote exploration and investigation. A yearning for more information leads to a desire. Be CURIOUS. It leads to DESIRE, the prerequisite for PASSION. I’ve always seen my role as a bass teacher as a cross between an investigator and a personal tour guide. People are unique and not all the same. As students, people are interested in different things, they learn differently from one another, they have different hot buttons that can ‘light a fire in their bellies’ and they respond to different teaching approaches and learning strategies. My belief is that it’s almost entirely up to the teacher to seek out these connective attributes that each student has. It’s the bass teacher’s job to see what makes them tick. With finely honed interview skills and keen observation, I find that I can get to the heart of why a student presents themselves to me to teach them the bass. And my experience of teaching bass lessons in Melbourne tells me that the reasons can be quite different. Have you ever taken a 2 week bus tour or even a longer tour perhaps? It’s almost always a two person team. A bus driver and a tour guide. After listening to the tour guide for a while, (the good ones will keep you entertained, informed and they can talk for hours about their surroundings) you start to get a sense of the wealth of knowledge and depth of experience that they carry with them. And they want to know about you too. Where are you from? What food do you like? Where places have you visited? What activities do you like doing? They do this for one reason. (The really big tip at the end of the trip – you say?) They genuinely want to give you the best possible experience they can by personalizing your journey. Yes, they have a roadmap and a tour schedule. But alternate routes can be taken. Different things can be said and pointed out, while other things that may be irrelevant for a particular group can be left out. Different conversations can be had on each and every tour. When I teach, not only do I draw upon my musical experience, I draw upon life experiences that enable me to observe, diagnose, investigate, appreciate, praise, repair, nurture, strengthen, build, create, guide and also learn.